As a professional philosopher, I am not inclined to believe in curses. However, my experiences over the years have convinced me that I am the victim of what I call the Curse of Springtime. As far as I know, this curse is limited to me and I do not want anyone to have the impression that I regard Springtime Tallahassee in a negative light. Here is the tale of the curse. For runners, the most important part of Springtime is the Springtime 10K (and now the 5K). 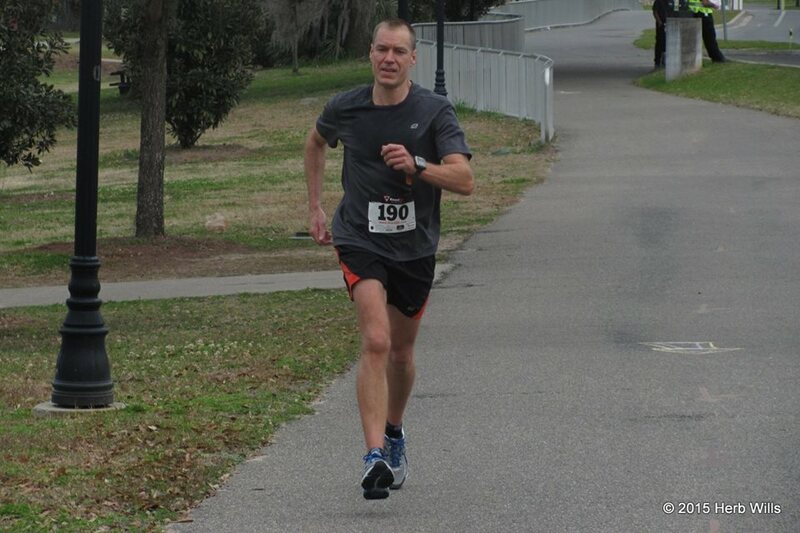 Since I moved to Tallahassee in 1993 I have had something bad happen right before or during the race. Some examples: one year I had a horrible sinus infection. Another year I had my first ever muscle pull. Yet another year I was kicking the kickstand of my Yamaha, slipped and fell-thus injuring my back. 2008 saw the most powerful manifestation of the curse. On the Thursday before the race, my skylight started leaking. So, I (stupidly) went up to fix it. When I was coming down, the ladder shot out from under me. I landed badly and suffered a full quadriceps tendon tear that took me out of running for months. When Springtime rolled around in 2009 I believed that the curse might kill me and I was extra cautious. The curse seemed to have spent most of its energy on that injury, because although the curse did strike, it was minor. But, the curse continued: I would either get sick or injured soon before the race, or suffer and injury during the race. This year, 2017, was no exception. My knees and right foot started bothering me a week before the race and although I rested up and took care of myself, I was unable to run on Thursday. I hobbled through the 10K on Saturday, cursing the curse. Since I teach critical thinking, I have carefully considered the Curse of Springtime and have found it makes a good example for applying methods of causal reasoning. I started with the obvious, considering that I was falling victim to the classic post hoc, ergo propter hoc (“after this, therefore because of this”). This fallacy occurs when it is uncritically assumed that because B follows A, that A must be the cause of B. To infer just because I always have something bad happen as Springtime arrives that Springtime is causing it would be to fall into this fallacy. To avoid this fallacy, I would need to sort out a possible causal mechanism—mere correlation is not causation. One thing that might explain some of the injuries and illnesses is the fact that the race occurs at the same time each year. By the time Springtime rolls around, I have been racing hard since January and training hard as well—so it could be that I am always worn out at this time of year. As such, I would be at peak injury and illness vulnerability. On this hypothesis, there is no Curse—I just get worn down at the same time each year because I have the same sort of schedule each year. However, this explanation does not account for all the incidents—as noted above, I have also suffered injuries that had nothing to do with running, such as falls. Also, sometimes I am healthy and injury free before the race, then have something bad happen in the race itself. As such, the challenge is to find an explanation that accounts for all the adverse events. It is certainly worth considering that while the injuries and illnesses can be explained as noted above, the rest of the incidents are mere coincidences: it just so happens that when I am not otherwise ill or injured, something has happened. While improbable, this is not impossible. That is, it is not beyond the realm of possibility for random things to always happen for the same race year after year. It is also worth considering that it only seems that there is a curse because I am ignoring the other bad races I have and considering only the bad Springtime races. If I have many bad races each year, it would not be unusual for Springtime to be consistently bad. Fortunately, I have records of all my races and can look at it objectively: while I do have some other bad races, Springtime is unique in that something bad has happened every year. The same is not true of any other races. As such, I do not seem to be falling into a sort of Texas Sharpshooter Fallacy by only considering the Springtime race data and not all my race data. There is certainly the possibility that the Curse of Springtime is psychological: because I think something bad will happen it becomes a self-fulfilling prophecy. Alternatively, it could be that because I expect something bad to happen, I carefully search for bad things and overestimate their badness, thus falling into the mistake of confirmation bias: Springtime seems cursed because I am actively searching for evidence of the curse and interpreting events in a way that support the curse hypothesis. This is certainly a possibility and perhaps any race could appear cursed if one spent enough effort seeking evidence of an alleged curse. That said, there is no such consistent occurrence of unfortunate events for any other race, even those that I have run every year since I moved here. This inclines me to believe that there is some causal mechanism at play here. Or a curse. But, I am aware of the vagaries of chance and it could simply be an unfortunate set of coincidences that every Springtime since 1994 has seemed cursed. But, perhaps in 2018 everything will go well and I can dismiss my belief in the curse as mere superstition. Unless the curse kills me then. You know, because curse. When I return to Maine, the deer flies and I play a cruel game: they try to bite my head, whilst I try my best to make them dead. The game is played on the bike trail and wood trails of the University of Maine. Back in the day, it was referred to as University of Maine at Orono (UMO) or UM “Zero.” I still call it that, partially because I’m a traditionalist about some things and partially because it really annoys some people. Anyway, back to the game. The deer flies, which breed by the thousands in the woods, try to bite me. They, for some reason, almost always go for my head. Normally, the game is played while I am running, which limits the game to the faster flies. This year, however, my quadriceps tendon repair limited me to walking the trails. I thought that this would entail that I would be surrounded by vast numbers of flies from the zippy fellows all the way down to the lazy ones. However, I just had the usual amounts. Perhaps they are a spotting lot and decided to stick with the classic game for old time’s sake. As I walked as fast as my bad leg would let me go, the flies launched their attacks. In response, I would try to grab them and send them off to deer fly heaven (populated, no doubt, by fat and immobile deer). As usual, the score was zero for the flies and about 60 for me. Since the flies have not scored once since I started running the trails a couple decades ago, one would think they would give up. But, I have to hand it to them: they are always ready for a go. They are not very good at the game, but their spirit is as great as their intelligence is small. Of course, since I am the only one who survives the game, they do not get much (any) practice. Just zoom and crush, a glorious death for a deer fly. Normally, I am against killing critters, but I’m fine with competitive sports. The flies show up to play and I would be remiss not to give them my very best. The fall that tore my quadriceps tendon gave me my worst injury ever. I can’t say that it is the worst thing that has ever happened to me, but I can say that it seems to be one of the top bad things. Not surprisingly, it has had quite an impact on my life. On the negative side, I’ve been unable to run since March 26. Since I’ve been a competitive runner since I was 15 and even went about 23 years without missing a day, the lack of running has been rather unpleasant. I have been biking and even have worked up to pool running. But, land running is but a memory at this point. Also on the negative side is a new fear I have-whenever I am moving about, I almost always feel a faint dread of falling. This really hits me on stairs, causing me to grip the rails and go up one stair at a time. Sure, I am just being cautious, but I do not like that feeling. It has faded as I have grown stronger, but it still lurks in the shadows of my mind. On the positive side, I have learned that I can handle this sort of adversity and focus on doing what it takes to recovery. I really had no doubt about this, but it is one thing to believe and another to know. The injury has also given me a chance to rest and recovery-something I have rarely been willing to do. Perhaps this will actually turn out to help me in the long run. In addition, I have had to add new things to my workout routines such as swimming, weight lifting, and so on. Ironically, in some ways I am more fit than ever. 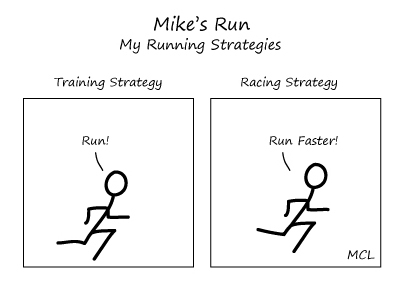 Of course, what remains to be seen is how well all this non-running exercise translates into running. I’ve long been a calm person who has had a talent for putting things in perspective. Of course, I was not always that way. In fact, as a kid I could have quite a temper. I found that the injury reinforced my calmness and sense of perspective. After all, minor things seem all the more minor in comparison. That is one useful thing about a bad injury-lesser things are put in their proper perspective. I cannot, obviously enough, say that I am glad I fell. But, I think that I have done well with the situation and have turned it to my advantage. That said, I would not recommend a serious injury as a means of building character.